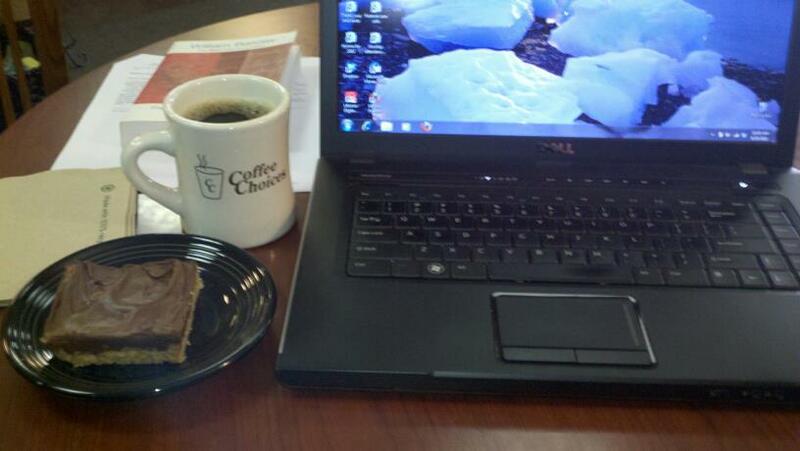 Ah…sermon prep time at my favorite location in Jackson ~ Coffee Choices. Each day at 10:20am I pack up my laptop and sermon prep materials and head downtown. I walk into Coffee Choices and I feel like Norm walking into Cheers. O the joy of small town life. I setup camp and greet my scotcheroo that is waiting for me (See lower left part of photo. I have a standing order every Thursday). I also order a cup of coffee (of course) and then place my lunch order to be ready at 11am. Each Thursday ~ the same routine (unless I let Coffee Choices know ahead of time). Some days it is busy and noisy. Some days it is quite peaceful (like today). Whatever the case I don’t care. The Holy Spirit can work in any condition. If this routine is disrupted, though, I almost panic ~ thrown for a loop. But the sermon still gets written. I don’t know how. (actually I do…refer to my previous Holy Spirit comment). …the scotcheroo, the coffee and the Cheers like feeling. Today I helped serve doughnut holes. It was nothing fancy just some regular, sugar and powered sugar doughnut holes. There was also juice and coffee…and a Kleenex or two (which came in handy). Today was the first day of school for the Jackson County Central school district. And we served doughnut holes. You see…Riverside Elementary School is right next door to Salem Lutheran Church and the most convenient way that parents can drop off/pick up their kids is via the church parking lot. Late August through mid-May; five days a week; and twice a day; dozens of cars (lots and lots of people) are coming to our property. So I challenged the church council last week. We (Salem members) set up camp in the church parking lot by the sidewalk that leads to the school. And there were the doughnut holes (and the juice and the coffee). And…a box of Kleenex (parents…you can probably figure out why). We welcomed kids and parents with a cheerful smile and a invitation to enjoy a doughnut hole and a beverage before school. Some didn’t know what to think of us. Some declined and wished they hadn’t just eaten. Some wished they hadn’t just stopped for coffee. All in all it was a good morning. But none of this had anything to do with us. It was all for the glory of God; to share the love of Christ with people in a practical way. I know it may sound like I am tooting our own horn here but that’s not what I am doing. I want to encourage others out there to find creative ways (as this church council did) in sharing the love of Christ with their communities. After all…being the Church is about going out into the world and telling people about God’s love through Jesus Christ. 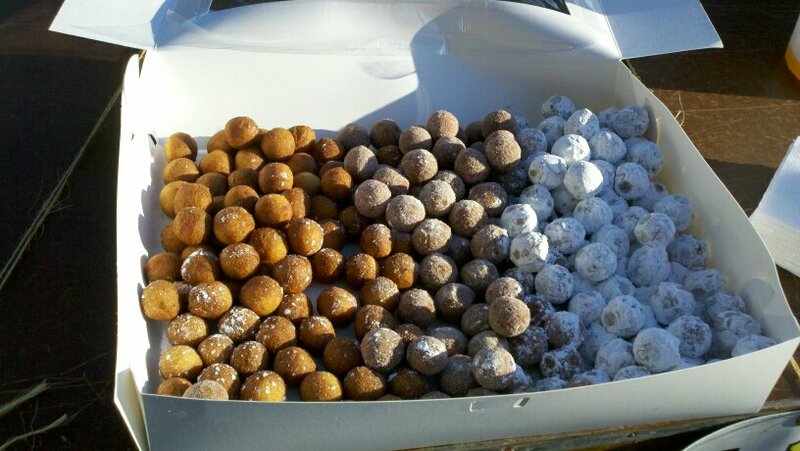 We didn’t preach sermons this morning, we just served doughnut holes….with a smile. Most people can do that without getting too nervous. How is God calling you to serve in your community? How is God calling you to share the love of Christ in a practical way? If there was ever a time when I needed to be reminded that God will never give us more than we can handle…it is now. –As I have mentioned before this weekend is Salem’s 125th anniversary and there is an open house at the parsonage tomorrow (Saturday). –The bathroom is being remodeled. We ordered flooring but as of Thursday is just arrived but no one was available to put it in = messy house for open house = stressed wife = stressed husband (me). Help! –[Here’s God intervening] One of my trustees has a son who installs flooring (why I didn’t remember is beyond me). She heard about our setback and called her son and he said he could come on Friday to install the flooring. PRAISE BE TO GOD! He just left (Friday morning) to get is tools so he can start. The bathroom will now be done by the open house = less stress for my wife = less stress for the husband (me). PRAISE BE TO GOD!!! –[Here’s God intervening again] Project #2…the patio. One parishioner is working on this (former landscaper) all by himself = lots of work. Yesterday and this morning people have been calling me left and right saying they are coming over to help Joel and get this done (Joel is happier). PRAISE BE TO GOD!!! And now I am feeling overwhelmed by God’s greatness and faithfulness. –[The priesthood of all believers] People from the anniversary committee, the congregation president, various other council members, parishioners, and friends from the community (a friend of mine who happens to be the council president at the other Lutheran church in town) have stepped up to make this weekend happen. Thank you and PRAISE BE TO GOD!! !